In 2016, the Panthers were on the cusp of hoisting the Lombardi Trophy, that is until Von Miller discovered that beating a Carolina offensive lineman was much like a New Orleans quarterback, a “Brees.” In the 2016 season opener, Cam Newton and the Panthers seek revenge in the altitude in Denver. The post-Manning era begins in Denver with Trevor Siemian as the starter. Siemian outperformed Mark Sanchez and Paxton Lynch to earn the starting position. The Buccaneers finished 6-10 last season, but showed enough flashes of excellence last year that fans in Tampa are expecting great things. The Falcons finished 2015 with an 8-8 record, but managed only one division win to go with five losses. Devonta Freeman then casually points out to Ryan that those words aren’t exactly the same as those said by Winston in his infamous 2014 incident. A red-faced Ryan apologizes, then urges his teammates to go out and win one for the Gipper. Ryan passes for two scores, and Winston matches him, but commits a costly late fumble to seal defeat for the Bucs. The Bills 8-8 2015 campaign was marked by inconsistency on both sides of the ball, but never fear, Bills fans, Rex Ryan is on it. 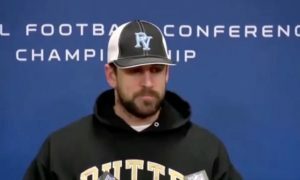 The foot perv “won the offseason” by hiring his twin brother Rob as an assistant head coach, and signing Reggie Bush to add depth to Buffalo’s backfield. Now the Bills boast another USC running back who doesn’t have his Heisman Trophy. “I don’t care that Reggie had to return his Heisman Trophy,” Ryan said. “He’ll still be an asset to the team, as well as the city of Buffalo. Heck, the NCAA has already ordered him to ‘give back’ to the community. Joe Flacco‘s knee is healed, and the Ravens are determined to return to contention in the AFC North, where the Bengals and Steelers are favorites. Tyrod Taylor passes for a score and rushes for another, and the Bills win, 23-20. The Bears look to improve on last year’s disappointing 6-10 record, marked by a 1-7 campaign at home. Gone are Joe Forte and Martellus Bennett, two of Jay Cutler‘s favorite targets. “Speaking of ‘favorite targets,'” Cutler said, “I’m often the favorite target, of insults hurled by Bears fans. But I have a great set of hands. I catch ‘hell,’ as well as a number of other four letter words. The Texans won the AFC South with a 9-7 record, then got what they deserved in a 30-0 home loss to the Chiefs in the wildcard round. But change is amiss in South Texas, where Brock Osweiler takes over as the new Texans quarterback after spending the last four seasons backing up Peyton Manning. The Houston defense forces 3 turnovers, and J.J. Watt sacks Cutler twice. Osweiler tosses a touchdown pass to DeAndre Hopkins, and the Texans win, 31-17. Gus Bradley begins his fourth season as the Jaguars head coach, and expectations are high for Jacksonville to make a run at the AFC South title. “EverBank Field should be rocking this season,” Bradley said. “Nothing beats the fans’ perspective of enjoying the game from the confines of the stadium’s swimming pool. But for fans longing for a player’s perspective, they can park their car in the one and only Denard Robinson lot, which is four feet underwater. With a healthy Jordy Nelson and a slimmed-down Eddie Lacy, Aaron Rodgers, and the Packers are favored to win the NFC North and make a strong Super Bowl run. “Jordy is free from the clutches of the training table,” Rodgers said, “while Eddie is free from the clutches of the dinner table. The Jaguars improved defense gives the Packers fits early, and Blake Bortles tosses an early score to Julius Thomas. But the Packers storm back, led by the scrambling ability of Rodgers, who is good on the run, and even better on the Munn. The Chargers organization spent much of the offseason negotiating the signing of first-round pick Joey Bosa. Bosa finally agreed to a four-year deal on August 29th. “I don’t know what took so long,” Philip Rivers said. “Maybe Bosa should have handled things more like a true Ohio State Buckeye and signed with an agentbefore he turned pro. In any case, I heard he celebrated with a tattoo and a new Monte Carlo, fully loaded, of course. The Chiefs aim to build on a successful 2015 season, which ended with a close 27-20 loss to the Patriots in the divisional round. The Raiders are primed to contend for the AFC West, with 2016 being the fifth anniversary of legendary Raiders owner Al Davis’ death. Oakland boasts a core of young superstars, with Derek Carr leading the offense, and Khalil Mack the defense. “If Al were alive today,” Jack Del Rio said, “he would look no different than he did when he died. And, he’d be proud of the team we’ve built. The Saints explosive 2015 offense was offset by a disastrous defense that was the major culprit in a 7-9 finish in the NFC South. After lengthy negotiations, the Jets finally resigned Ryan Fitzpatrick to a one-year, $12 million contract in late July. The Bengals season ended in a stunning 16-15 home playoff to the Steelers, as consecutive personal foul penalties on Adam Jones and Vontaze Burfict completed the collapse that led to Chris Boswell‘s game-winning field goal. Mike Nugent kicks a 33-yard field goal late in the fourth quarter to break a tie, and George Iloka picks off Fitzpatrick to seal Cincy’s 23-20 win. The Robert Griffin III era begins in Cleveland, and new head coach Hue Jackson is confident Griffin can find success as a Brown. The Eagles made Carson Wentz the No. 2 pick in April’s draft, and with Sam Bradford‘s trade to the Vikings in early September, head coach Doug Pederson handed the offense to Wentz. With Teddy Bridgewater lost for the season with a knee injury, the Vikings acquired Sam Bradford in a trade with the Eagles. “Losing Teddy was hard for the entire Vikings organization,” Mike Zimmer said. “It’s akin to getting kicked in the nuts with a foot, which, as Adrian Peterson would tell you, is painful, but not nearly as troublesome as getting whacked in the scrotum with a switch. The Titans spent the offseason building a strong running attack, signing DeMarco Murray via free agency and drafting Alabama running back Derrick Henry in the second round of the NFL draft. The Vikes start Hill at quarterback, and the Titans load the box, intent on forcing Hill to beat them, which he does, by handing off to Peterson 28 times. Peterson busts in for two short scores, and the Vikings prevail, 22-14. The Dolphins snatched up former Chicago offensive coordinator Adam Gase as head coach in January, and added veteran running back Arian Foster via free agency in July. “I love the offensive philosophy that Adam brings,” Ryan Tannehill said. “The objective for our receivers is to get vertical and for me to throw directly downfield. We call that the ‘Gase and Straights’ offense. Pete Carroll and the Seahawks will embark on an NFL season without Marshawn Lynch for the first time in six seasons. Thomas Rawls will carry the load at running back, but quarterback Russell Wilson is Seattle’s unquestioned leader on offense. “I’ve given Russell full control of the offense,” Pete Carroll said. “And I can always count on him to make the right call. Whether he’s behind center or in front of a camera, Russell always says the right thing. After a 6-10 2015 campaign, Tom Coughlin resigned as head coach and the Giants promoted offensive coordinator Ben McAdoo to the position. McAdoo again expects big year from wide receiver Odell Beckham, Jr.
“Odell has 13 receiving touchdowns last year,” McAdoo said. “That’s .81 touchdowns per game, or, in terms that an NFL player can really understand, that’s .65 touchdowns per Josh Brown domestic violence incident. 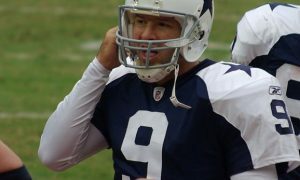 Cowboy hopes took a huge hit in late August Tony Romo broke a bone in his back that will likely sideline him for 6-10 weeks. Rookie Dak Prescott, who flourished in the preseason, will assume the role of quarterback and all the pressure that comes with the territory. Giants win a shootout, led by three touchdown passes from Eli Manning. New York wins, 30-26. The Lions begin the 2016 season without Calvin Johnson, who retired last season after nine seasons in Detroit. “Megatron rode off into the sunset,” Stafford said, “mostly because he couldn’t walk there. But good luck to Calvin on ‘Dancing With the Stars.’ He may not last long, because I think his legs are only good for two steps. Andrew Luck is back at full strength after missing the final nine games due to a lacerated kidney and a partially torn abdominal muscle. With Tom Brady serving a four game suspension for his role in Deflategate, the Patriot offense is in the hands of Jimmy Garoppolo. The second-year Patriot has attempted only 31 regular-season passes in his career. The Cardinal advanced to the NFC title game before crash-landing in a 49-15 loss to the Panthers. That loss motivates Carson Palmer and his teammates to return to the title game and advance to Arizona’s second Super Bowl. Washington rode the emerging talents of Kirk Cousins to the NFC East title last season, and Jay Gruden is looking for even more out of Cousins in 2016. The Steelers lost in the divisional round to eventual Super Bowl champion Denver, and begin their 2016 quest without Le’Veon Bell, who is suspended for the first three games for missing a drug test. Chip Kelly is the new head coach in San Francisco and he inherits a team that finished 5-11 last year, second-worst in the NFC. After calling St. Louis home for 21 years, the Rams moved to Los Angeles after the 2015 season. Running back Todd Gurley remains the face of the franchise, while Jeff Fisher begins his fifth season as head coach. “I’m proud to say that my teams have finished fourth or better in the NFC West in all four of those seasons,” Fisher said. Todd Gurley trots in for a 17-yard touchdown late in the third quarter, and the Rams hold on for a 20-14 win.